The pilot edition of the first trail running event in the picturesque Rimetea – Colțești area of Trascău Mountain in Transylvania (Romania) – where the legend says the sun rises twice! – was a total hit among outdoor sports lovers. Trascău Trail Run 2018 was organized by Green & Wild Association in partnership with Porsche Engineering Romania (Cluj-Napoca office) and the local Rimetea City Hall, with the support of the Alba County Mountain Rescue. The main race was set for a 23.5km half-marathon with steep terrain and sky-race features with an elevation gain of 1500 m! The trail course covered the scenic Piatra Secuiului (The Seclar’s Rock), the Colțești Fortress and the Aradșcheia Mountain. 121 runners finished the technical race, while 37 families (or 74 runners) attended the fun Family trail run race. The race was won by the Romanian Long Distance National Champion – Gyorgy Szabolcs-Istvan with an amazing time of 2 hours 22 minutes 23 seconds! The best female run belongs to Ionela Dobrita with 2 hours 50 minutes 47 seconds. The first edition of Trascău Trail Run awarded the top 5 best runners for male and female category. We must also note that due the technical aspect of the race, the first quarter of the runners finished under 3h 19 min. The youngest half-marathon runner was aged 16, while the oldest was 63 years old. The beautiful ladies counted for 26% of the total athletes, which impressed the organizing team, taking into consideration the race and the elevation gain. An amazing community of 270 people gathered around the races, the fantastic local gulyas and the Award Ceremony followed by the most attractive raffle of professional trail running equipment organized by Alpin Expe, the main event sponsor. 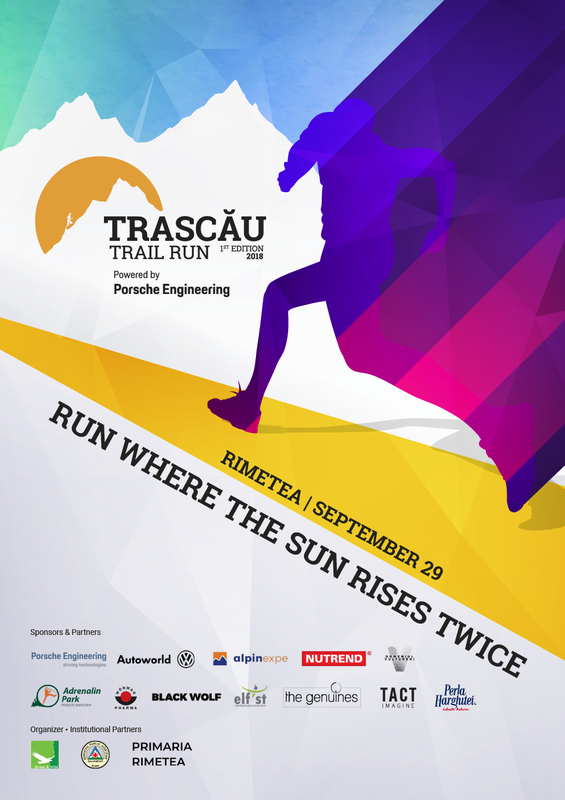 Should all this sound amazing for the trail running amateurs, Porsche Engineering Romania invites you all to the next edition of Trascău Trail Run 2019 in Rimetea, Transylvania. The title legend of this race is “Run where the sun rises twice!”. The long and barren calcar massif that “dominates” Rimetea, is cut in two by an aprubt valley that makes so that, from may to september, the sun seems to rise twice in the same day for the people living up north in the village. Organizer: Green & Wild Association in partnership with Alba County Moungtain Rescue and Rimetea City Hall. Visual identity and new media: Black Wolf Studio, The Genuines. Promo material production: TACT Imagine. Media Partners: Radio România Cluj , Cluj Web Story, Zile si Nopti.